Deciding what shoes to pack for Asia really just depends on what you plan to do once there. Luckily, flip-flops—often the default choice for footwear in Asia—are lightweight and easy to pack! The default, footwear of choice in Southeast Asia—and many other parts of Asia, for that matter—is the simple flip-flop sandal. From the islands to big cities, locals wear them daily. In fact, if you didn’t plan on going to up-scale establishments or doing any serious trekking, you could get by just fine on your trip with a single pair of flip-flops. So why flip-flops? Along with Southeast Asia’s heat which makes wearing socks uncomfortable, it is custom to remove your shoes before entering homes, temples, and many businesses. The policy varies according to business, however, many places outside of major cities will ask that you remove your shoes before entering. Removing the shoes is a Buddhist custom; doing so keeps the dust and filth from the streets -- both literal and metaphorical -- out of the establishment. Slipping flip-flops on and off quickly is far more practical and less hassle than bending over to tie laces or fasten straps each time. While you’ll want to arrive with a practical pair of shoes already on your feet, flip-flops are for sale in every market and mall. You can purchase a cheap, throwaway pair that may or may not last the duration of your trip, or you can splurge on a slightly more durable pair for around $6 USD or less. As mentioned, you’ll need to leave your shoes outside of many bars, restaurants, temples, and even guesthouses, depending upon the establishment’s policy. Shoes are often left in a large, unattended pile by the door—a serious temptation for people who need an upgrade! Sandals are regularly swapped or stolen, particularly in the islands. 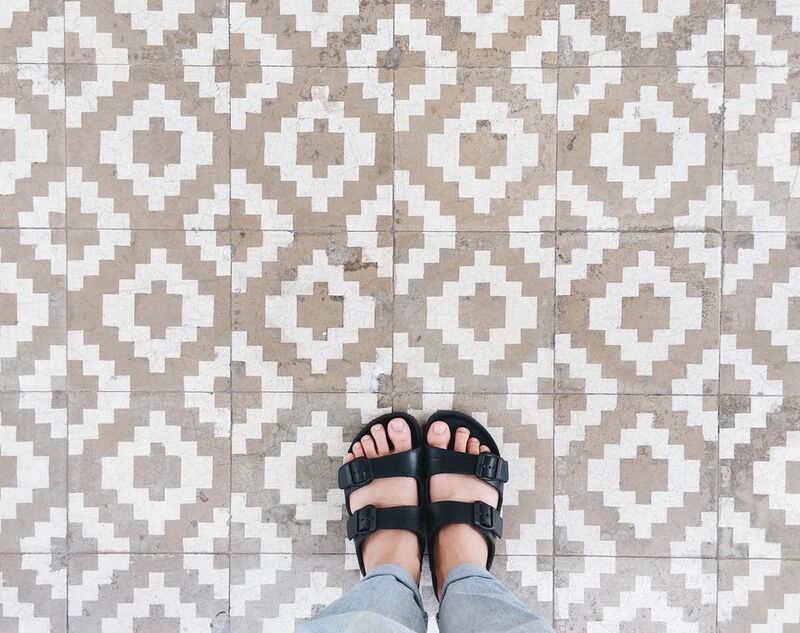 When it comes to choosing the right pair of sandals to wear in Asia, keep it simple and cheap. Leave your favorite pair of Tevas, Chocos, authentic Birkenstocks, or other name-brand pricey sandals at home. Instead, opt for a comfortable, nondescript pair of flip-flops that won’t draw too much attention. While most bars and restaurants are casual, a few upscale establishments actually do maintain a dress code. You’ll need a pair of shoes nicer than flip-flops if you intend to visit the upscale clubs and rooftop bars in Bangkok, Bali, and a handful of other places. What Footwear Is Best for Adventures? If you intend to do some light trekking, you may opt to go for a lightweight hiking sandal. Many brands offer lightweight, open-air hiking sandals with good traction for wet and slick environments. Keen’s Clearwater CNX sandal is just one example. These hiking sandals won’t take up too much room in your luggage, aren’t too hot for tropical environments, and offer at least some protection for outdoor adventures. Needless to say, if you plan on doing any climbing or serious time in the jungle, you’ll want a proper hiking boot, preferably something lightweight with low tops and good toe protection. Waterproofing is essential; spray your footwear to ensure that feet won’t get too wet while walking in the rainforests of Southeast Asia. Baby powder will help keep the inside of your shoes dry and odor free for packing. Renting a motorbike is a fun way to get around in Asia. While locals happily ply the roads in flip-flops, having better footwear will offer a safer experience if you plan on doing a lot of driving. In general, just a stroll around many cities in Asia can be somewhat hazardous. In Beijing, infants are often garbed in pants equipped with a strategic hole so that they can take care of business on the streets. Sticky, green mucus—a byproduct of terrible urban pollution—accumulates on sidewalks. Throughout Southeast Asia, particularly Thailand, you’ll encounter sidewalks with loose tiles that have been known to flip or shift, causing foot injuries. The horrors of Bangkok’s sewers are hidden just beneath the sidewalk; watch your step! Many of the smooth tiles found in Asian cities such as Kuching in Borneo become incredibly slippery after a rain. For these reasons alone, having adequate protection for your feet is a must. Although flip-flops are typically the footwear of choice in warm climates, keep in mind that your feet may be exposed to additional hazards. Even the most insignificant of scrapes on an ankle or toe can quickly fester in the warm, dirty environment.